I think about those words and in my mind I see a sandy beach with gentle waves lapping, a cool breeze that doesn’t mess up my hair, bright sunshine that warms my skin, and a good book with a happy ending. Yup. I sure could be content there. If only life was one big sunny beach. Real life happens and sometimes my hair gets mussed and my skin sunburns and there’s not a happy ending in the book. My sisters and I take turns staying with our mom. Alzheimer’s has certainly changed how we are choosing to do our lives. A few weeks ago, it was the Glucerna spill that pushed me into a new level of whining and self-pity. I had walked into mom’s room and found her sitting on the edge of her bed, trying to wipe up the strawberry drink that had created a pink covering over everything within an arm’s reach. It was 3:00 a.m. I’d gone to bed just a few hours earlier and had to get up in a couple more. Did I mention that the room temperature was set at 78˚ and the TV volume was set at “Let’s make sure everyone in the apartment building can hear this?” Have you smelled strawberry Glucerna when it’s not contained in a covered glass? The moment was hot, and it was loud. I was tired and crabby. I found myself thinking, This isn’t what I thought these days would look like. I didn’t want to do this anymore. Yup. Poor me. Poor, poor me. Start the pity-party music. Life doesn’t always turn out the way we imagined, does it. Parents get old and don’t remember what to do next. Children have health issues that make you really wonder about God’s mercy. Life events drain bank accounts, families argue, and souls hurt. And we’re still expected to show up. How do we do life then? I can choose how I experience this moment. I could choose to live in a place that accepts the messy reality, while remembering that this is a moment. And in this less-than-desired moment, I have access to the Peace, Strength, and Grace that I need. It’s like living in two worlds: a world of frustrating circumstances and a world with hope for a better tomorrow. I could live in both of them. The smelly, messy Glucerna world wasn’t going to go away on its own, and a more peaceful, cleaner world was just around the corner. Knowing that, I could choose to settle down. Take a breath. Change my perspective. I know I’m not alone in this. You’ve had your life moments too, when you’ve bravely whispered into the air, This isn’t what I signed up for. In that honest reveal of what’s stirring in our hearts, let’s remember that we can choose our response. The situation may not be what we signed up for, but it is our reality. And all our whining and muttering and fretting isn’t going to change it. We can stay in our pity-party, which really is a very lonely, sad place, or we can leave that party, close the door behind us, and find a different place to live. We can choose to take a deep breath, relax our shoulders, and remember that God can give us everything we need to get through the moment. He can slow our heart down. Give us patience. Help us to be kinder. 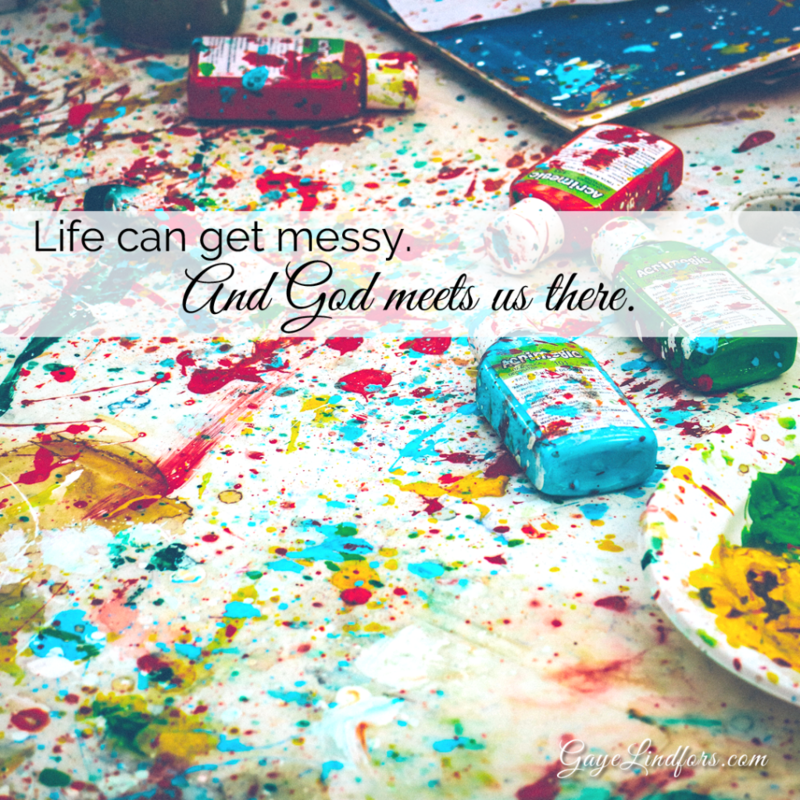 He will meet us in our messy. And then it won’t feel quite as messy. Thank you! We are excited to see you at The Residence at North Ridge soon!